Manufacturing seamlessly drawn tubes made from brass and aluminium and then further processing them is an art. To master this art, you need experience, knowledge of materials, sure instinct and of course, the right machinery. The Peterseim company, based in Olpe, is one of just a small handful of manufacturers of international renown that master this art. Peterseim has demonstrated good business sense by investing in tools and machinery. 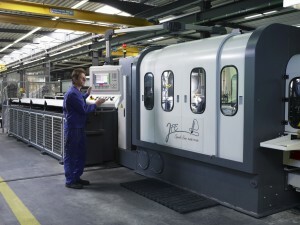 A further investment in a JFE sawing and chamfering machine has also proven to be a good decision. Our company is not only engaged in the manufacture of seamlessly drawn tubes but we also carry out further processing, and we are continuously investing in our tube processing plant. A new machine for processing tube ends has recently been put into operation. We have designed and constructed it ourselves, which has allowed us to take full account of our customers’ requests and to make use of our vast experience when it comes to processing various materials. The new tube end processing machine is used when drilled holes, threads or milled grooves are required. Apart from that a multitude of other processing possibilities is available from Peterseim. Early in 2007 a new JFE machining centre was installed which has excellent possibilities for processing brass, aluminium, copper, steel, etc. tubes. In addition to processing tubes we have produced ourselves, our high performance equipment enables us to also process materials provided by our customers on a jobbing basis. We will be pleased to provide more information on our new machining centre or to submit a quotation for your particular requirements.